I'm on Instagram (follow me if you aren't already!) and there is this thing called "Throwback Thursday". Today I shared two photos from really fun races and that got me thinking about all of the racing that we do. I love racing, obviously, and I had actually seen someone do a "Race Superlatives" post a long time ago. I thought I would do that today, especially since we don't really have anything new going on right now. Our life is: train, eat, sleep, repeat. Oh and some work thrown in there too for good measure. This is a tough one, so many of our races are fun! I think that Seneca7 takes the prize for this superlative, though. Running 77.7 miles around Seneca Lake, peeing on the Sheriff's property (oops! 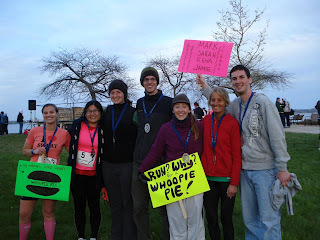 ), running with Mike, my mom and our friends, having our own personal cheering squad and running for whoopie pies, what could be more fun than that? A marathon is difficult, challenging and grueling on its own but I had mental challenges that I needed to overcome that I never expected would happen. Seeing Mike DNF at 18.5 miles added a unique challenge that I had to overcome on my own. It was difficult and I wanted to give up, but I didn't. Of course there were also the physical difficulties, such as feeling tired, my back was in excruciating pain, etc. 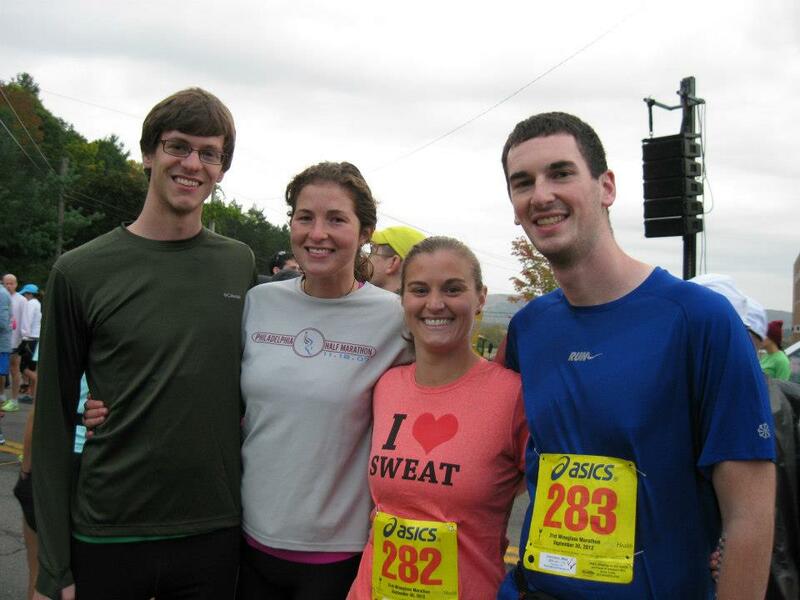 but those were overshadowed by the mental difficulties that I faced on the day of our first marathon. 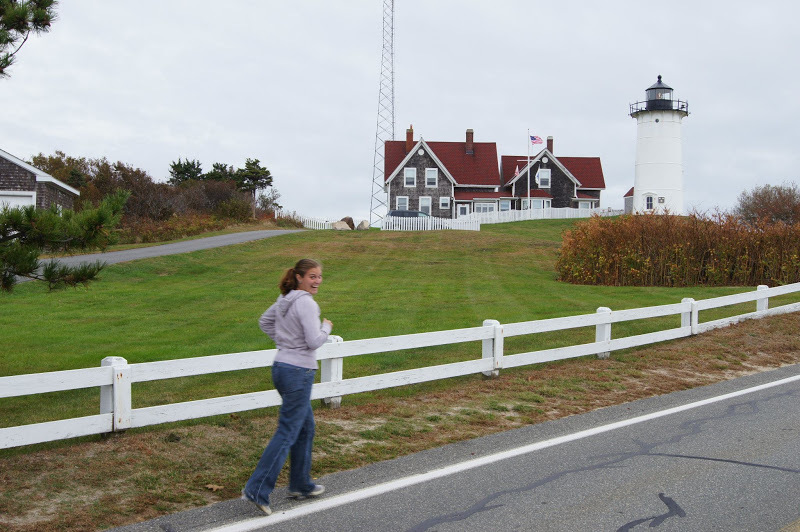 The Cape Cod Half Marathon was extremely scenic, Cape Cod is beautiful and you run by Nobska Point Lighthouse. Obviously not during the race! Although the race didn't go exactly how I wanted it to, the views made it worth it and I would definitely recommend this race if you are looking for pretty views to take your mind off of the fact that you are racing! Boring? Hmm, that's a tough one. I don't think that while I am racing that any race is boring, but after the fact there are a few that didn't do much for me. The Polar Bear Series half marathon's course is pretty boring (it's an out and back and not in a very interesting area), but when we ran it it was 75 degrees in March. Not really boring then, it was pretty challenging in fact! I don't have one that is completely nostalgic right now, that will be the MDI Marathon since I am from there, but pacing Crystal at the Hyannis Marathon while running a two-person relay with Mike was one of my happiest moments as a runner so far. I was honored to share this moment with Crystal! It brought back feelings from our marathon and hopefulness that we will feel this happy when we finish the Cleveland Marathon. I got to drink blueberry beer, I don't really need to say much more. 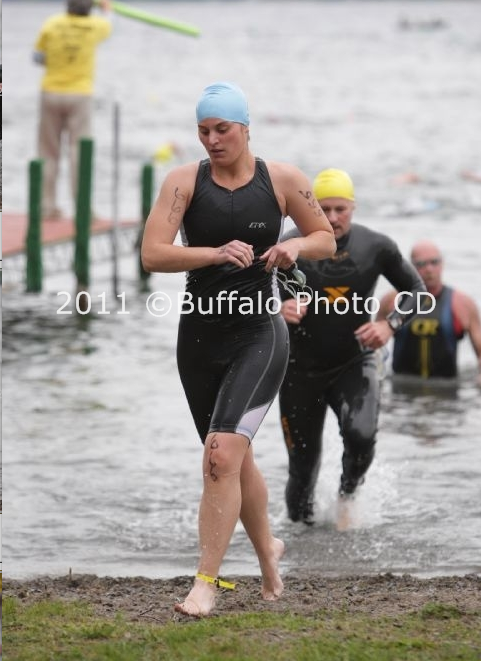 Keuka Lake Sprint Triathlon, our first triathlon. 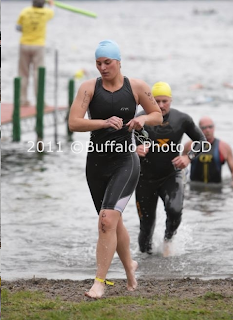 We had worked so hard and I felt like a real triathlete, finally! We loved this race so much that we are doing it again this year, but the Intermediate distance this time! 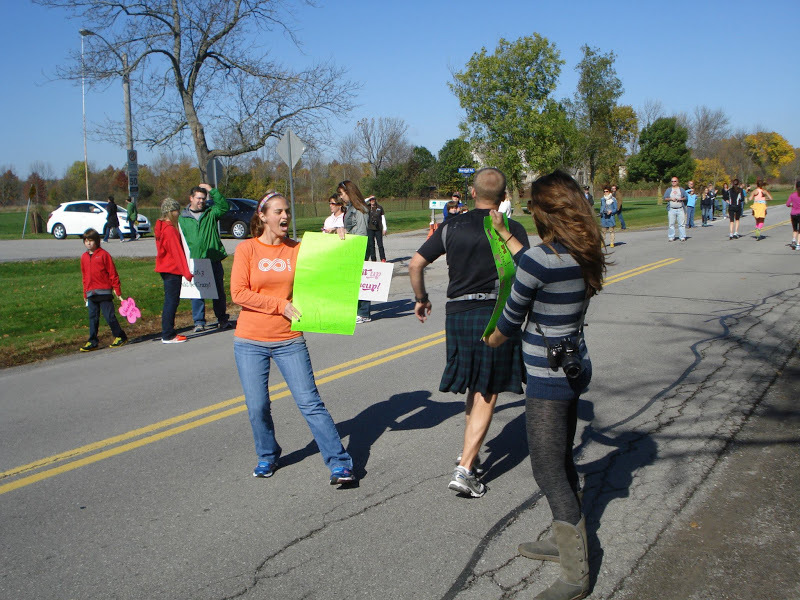 I had an amazing time spectating and cheering on runners, and our friend Amber, at the Niagara Falls International Marathon. We got to spend time with Ali, Colin and Logan which made it extra special! 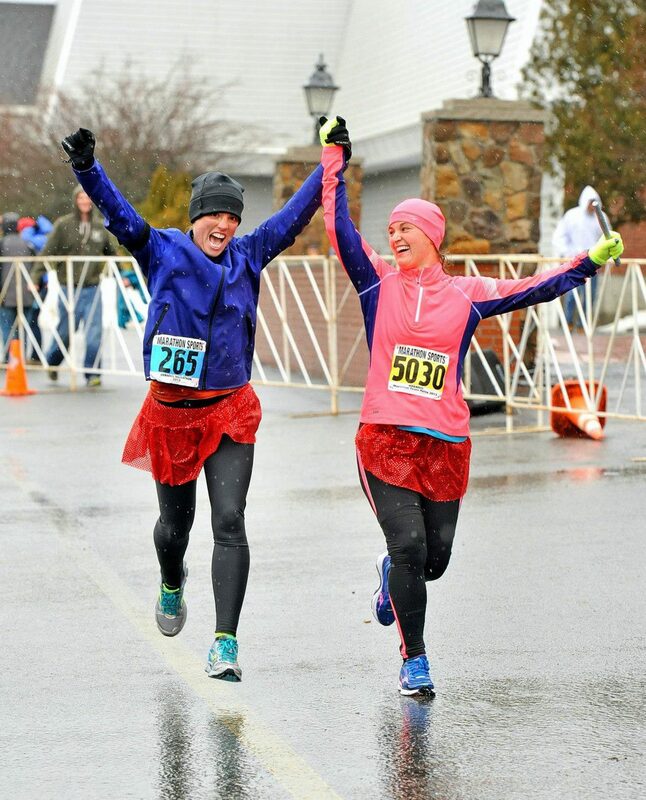 I would definitely love to spectate another race like this, it is so inspiring to see runners achieving their goals, and it is fun to cheer them on! Now your turn, I want to know your race superlative winners! YES to Seneca7 and the Boilermaker--those were both so much fun! And I obviously agree with you: the Seneca7 was literally one of the best days ever, and the post-race party after the Boilermaker was a lot of fun. Wish I could do them both this year! What a fun idea! Great way to remember all you have accomplished too! Best Swim course in a Triathlon: Gravenhurst Tri (Olympic Distance). Board an old-time steamship which takes you out 1.5km into Lake Muskoka... jump off, and swim home! I love you! When I explain how we met it goes like this,"I followed her blog and Twitter and was completely in awe of her. I would get all excited (and still do) if she'd mention me or comment on my blog. She inspired me and encouraged me when I couldn't even run really. 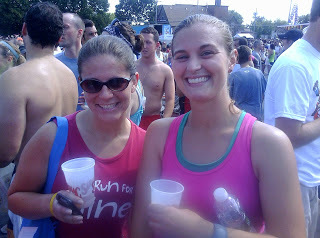 Then she made me believe I could run a half marathon...and we met finally in real life and were instantly friends. Then she made me believe I could run a marathon & her and we husband got me to the finish line. So basically I was a creepy stalker turned real life friend...no restraining orders are pending." I hear that and think of you. I love reading and seeing all your races in photos. Keep up all that you do! Even though we're friends I'm still a creepy stalker fan. Haha! Great pictures! :) Fun little recap! The Boilermaker was my first race ever and hands down the best post race party ever. I'm not sure of my summer travel plans, but if I'm free this summer I think I go to cheer for friends and enjoy the party! Glad to see the Boilermaker made best post race party...I'm running it this year! Are you?!?! :) Great post, thanks for sharing. We won't be, it's the same weekend as Musselman 70.3! It's always fun to look back over races like this! Can't wait to see what the rest of this year holds for you! What a cool idea!! I really loved that post where you paced Crystal--so awesome that she had you!! What a great idea for a post! I don't think I've done enough races to do one, but I enjoyed reading yours! A few of the top of my head. I haven't run many races like you. What a great recap of your race superlatives!!! You are a racing queen - and have so many to choose from! Happiest - Maine Marathon - my first marathon! Okay - now I'm at a loss.....I should work on this! I love this post Jamie! Many of those races are some of my favorite recaps of your races. I'd have to think about most of these but the two races that stick out the most are my first half marathon and my first full. Nothing will ever compare to those two races! This was so much fun! That pic of you and Crystal is the best! You have had so many fun race experiences Jamie. I love it!